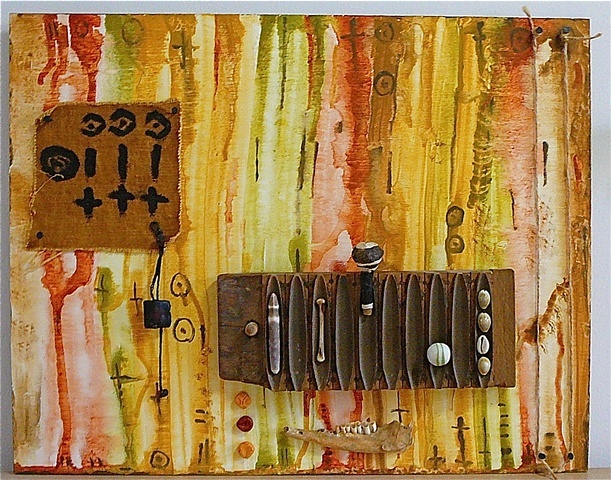 mixed media on wood: watercolor paint, mud cloth (made by me), animal jawbone, shells, nails, twine, cigar mold, african fetish, fetish magical powers bracelet, bone, beads from africa. this new art piece is a totally different "style" for me (sort of). for those of you familiar with my art you know that i have worked in mixed media/collage previously. but normally i do not work "non representationally" (if that is the correct word?). there are usually "figures" "people""creatures" in my art. however, for this piece, they did not seem to belong. i must confess that it was quite hard for me to NOT put a figure/face/hand/etc. in the art piece. i resisted mightily...and am pleased i did. they would not compliment the piece i don't think. still, this is a new style for me...and although i like it and am quite satisfied...it turned out exactly as i envisioned it in my mind's eye before i began...i am still not use to not seeing my "usual cast of characters". i am pleased that i tried something different and new (for me). an auspicious way to begin 2010! I like fabric, clothes, and small articles in Africa, India, and Indonesia. wonderful of work to use peculiar pattern and wooden form. Fact of handmade. the fantastic experience gives birth to the bang-up job !! This is a fantastic work Jennifer! All of the different elements are wonderful--LOVE the palette you used! Visually and texturally fascinating! Nice piece with some great concepts and execution. A very interesting piece Jennifer! I like its rustic quality. I love to see your new work! Your "non representationally" is one from your best. You should watch twice by that way. Your image talk a lot. you have something new to discover in that direction! ¡¡Buena edición en un buen trabajo!! Love the colour , great mixed !!!! yes....it is different for you, but it is still sensational. hi Jennifer, this in absolute is mine preferred! Attract a lot me both as, both because makes me dream Africa, then the objects is really genial that have used in this your picture! Still a great compliment for your great artistic ingeniousness! Hi Jennifer, I really love it! A pleasure to discover it. Good luck with your work! Awesome work of art! The colors are exceptional! Superbe hommage et expression de l'art africain.... bravo ! You do such interesting pieces, I envy your talent. well done ... i like this assemblage very much! Highly original, beautiful painting ! Eccellente resa cromatica, ottimo scatto! Awesome work , have a nice weekend Jennifer . Superbes couleurs ! les couleurs de l'Afrique ! Lovely tones and lines in this one, Jennifer. Mysterious and primal. I think it's good practice to sometimes work entirely with symbols - and of course paying attention to the building blocks of visual imagery: colour, texture, shape, line. Great work, Jennifer!